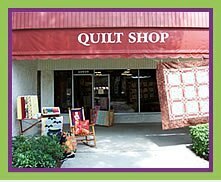 The Heritage Quilt & Needlework in Tampa, Florida has now closed and has taken to the road. I have joined Betty Sadow, the owner, for this “On-the-Road” adventure. See our schedule in the Events Calendar. The web page is still active for browsing and placing orders. Yo-Yo Makers used in my quilt patterns may be purchased at your local quilt stores or from the Clover company direct. Judy & John Hall of The Rock, N.S.W. Australia, now carry some of my patterns. Be sure to visit their web site. Jackman's Fabrics is one of my favorite fabric stores whenever I visit St. Louis. They often carry my patterns.